Being on the constant hunt for new materials, unusual yet performing plants, exquisite furniture, breathtaking features with which to thrill our clientele is in my opinion one of the best, yet overlooked part of being a Garden Designer. For this reason, we always try to make time for Futurescape in our – always busy- November calendar. 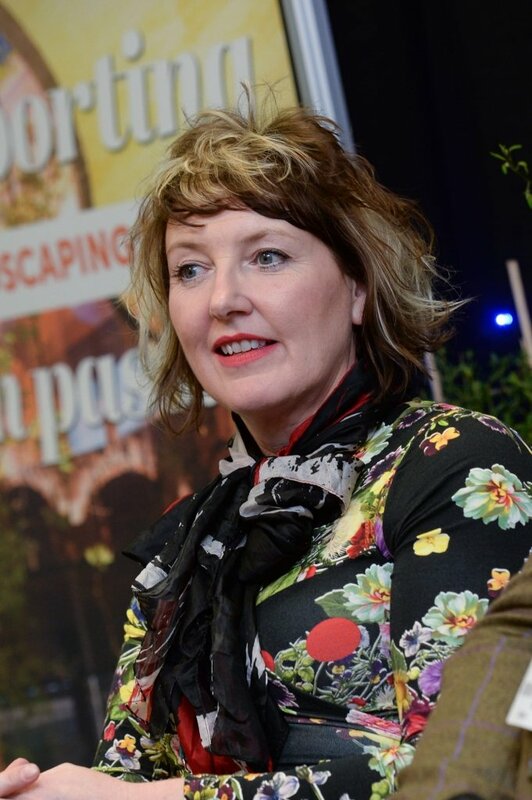 With so many lovely and diverse projects to source for at Ann-Marie Powell Gardens, the entire team visited the 2018 edition, each of us with an extensive list of companies to talk to while principal Ann-Marie was speaking on stage along with other key industry professionals at the ‘Let’s hear from the landscape legends‘ debate. Round Wood of Mayfield – A company that I haven’t had the occasion to specify yet but that definitively caught our eyes for their sleek, cleverly designed garden rooms. Envisaged initially as mini dwellings for boutique B&B and hotels, these have quickly won the public and landscapers hearth, and I can easily see them complementing our contemporary yet naturalistic designs. CED, the company who supplied all the natural stone featured in AMPG’s recent Countryfile’s 30th-anniversary garden at RHS Hampton Court Flower SHOW 2018, caught my eye once again with laser-etched granite. A service that has been around for few years and is available for most natural stones, I am only now envisaging its potentials in creating contemporary outdoor living rooms. Platipus anchors needs no presentation to anyone in the industry; their concealed anchoring and watering systems are a must. As my professional skills rotate more toward the soft-landscaping element of the design, I am ever so grateful to deal with suppliers such Mandy, always ready to stand out and assist us in specifying the most appropriate product for each of our design need. Left to right: CED stone, Botanic motif on sandblasted granite – Mandy from Platipus anchors – Millboard LED prototype- Some of the many patterns available at Lateral Design. Although I am personally moving away from composite and made-made materials as part of my own personal plastic-free/low carbon footprint journey, I can definitively see the benefits of using millboard in some specific sites where other natural materials would be otherwise challenging, and I was very excited to spot the newly developed bullnose system (Millboard HQ, if you are reading this, the entire AMPG team would also love it in Vintage Oak please!) as well as a prototype of their LED step lighting. A company that we kept our eyes on as it was developing much needed decorative drainage solutions, we have been impressed by the new range and new patterns.